Wine marketers and restaurateurs have a vested interest in helping novice wine drinkers to learn more about wine, with the goal of encouraging them to purchase more wine and higher quality wine (with its higher price tag). The question posed here is how best to conduct that educational effort, using a perceptual approach or a conceptual approach. Most wine promotions tend to be perceptual, in the form of tastings and printed tasting notes. 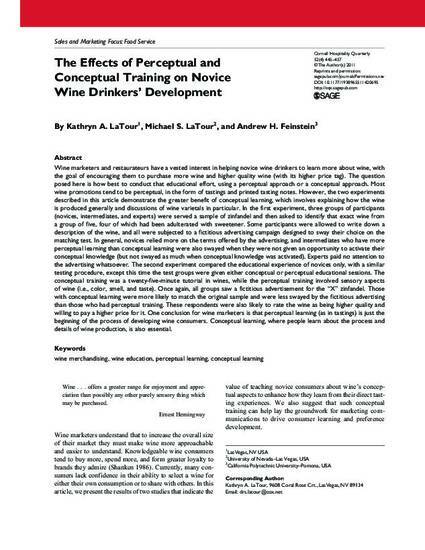 However, the two experiments described in this article demonstrate the greater benefit of conceptual learning, which involves explaining how the wine is produced generally and discussions of wine varietals in particular. In the first experiment, three groups of participants (novices, intermediates, and experts) were served a sample of zinfandel and then asked to identify that exact wine from a group of five, four of which had been adulterated with sweetener. Some participants were allowed to write down a description of the wine, and all were subjected to a fictitious advertising campaign designed to sway their choice on the matching test. In general, novices relied more on the terms offered by the advertising, and intermediates who have more perceptual learning than conceptual learning were also swayed when they were not given an opportunity to activate their conceptual knowledge (but not swayed as much when conceptual knowledge was activated). Experts paid no attention to the advertising whatsoever. The second experiment compared the educational experience of novices only, with a similar testing procedure, except this time the test groups were given either conceptual or perceptual educational sessions. The conceptual training was a twenty-five-minute tutorial in wines, while the perceptual training involved sensory aspects of wine (i.e., color, smell, and taste). Once again, all groups saw a fictitious advertisement for the “X” zinfandel. Those with conceptual learning were more likely to match the original sample and were less swayed by the fictitious advertising than those who had perceptual training. These respondents were also likely to rate the wine as being higher quality and willing to pay a higher price for it. One conclusion for wine marketers is that perceptual learning (as in tastings) is just the beginning of the process of developing wine consumers. Conceptual learning, where people learn about the process and details of wine production, is also essential.